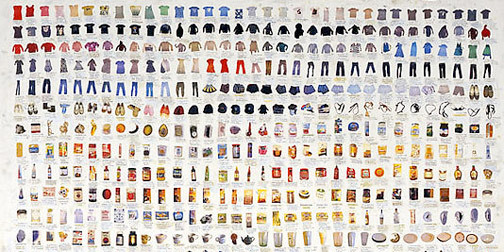 This idea definitely makes you reflect on your own belongings and consumerism. I'm trying to imagine how big or small an inventory of everything I own would be, and just how long it would take to catalog. I'm sure at the end of the process I would want to give away everything and move to a hut on the beach. I'll add this to my To Do List, just in case. You can see Simon's work in NYC at the James Cohan Gallery, now until April 4th. (Found through PSFK).